My name is Alison Geesey, and I am a recent graduate of the music education degree program at the Pennsylvania State University. As a music educator, I possess a passion for teaching and learning about music; however, I have found that my personal standards for my music classroom set me apart from other candidates in music teaching positions. While my emphasis lies in secondary choral music education, these principles apply broadly to the topic of music education as a whole, as does my degree certification. If given the opportunity to teach in your school district, these educational values, as outlined below, would be applied daily in my classroom, regardless of musical topic or area of study. Most obviously, the study of music provides students with a basic understanding of the principles of music. Though it may seem this only includes the ability to read and perform music, music education also provides students with a lifelong appreciation of music. This includes the skills necessary to analyze, evaluate, and describe music at a deeper level, as well as the connections between music and the other fine arts and ties between music, culture, and history. As a choir director and music educator, one of the most defined goals for my students encompasses all of these principles; with these tools, students possess the ability to make music for the rest of their lives, outside of solely the school curriculum. As briefly mentioned, music education also provides students with the opportunity to learn more about culture and society; this includes both the backgrounds of my students as well as customs and traditions from all over the world. Being a fine art, music is practiced all over the globe and acts as a window into international life for today’s students. While this creates a better understanding of the world for my students, it also incorporates lessons in national and world history, bestowing composers’ and artists’ personal reflections on events that all students deserve to be exposed to. I find that making these connections ignites a deeper interest in repertoire for my students, allowing them to not only understand the music better but to perform it at a higher level as well. In addition to providing an understanding of other people and cultures, music education also allows students to create a better definition of themselves individually. Music provides multiple opportunities for students to master self-expression but also allows students to learn to apply their own interpretations to music they perform and listen to. Truly “making music” involves both seeing what the composer has written on the page and making your own understanding so that the performance really means something to you; this is something I strive for when working with all of my choirs and students and also something I hold myself to as an individual performer. Therefore, while music certainly involves the act of reading and performing music, many other aspects also play a key role in my music classroom. Understanding music in relation to culture, society, and history allows my students to perform music with higher levels of intricacy than just the notes on the page. By giving my students the opportunity to make their own personal connections to our repertoire, students experience self-discovery while simultaneously creating group expression with their peers. All of these values combine to generate the unique learning environment of my music classroom, and I look forward to the opportunity of sharing these ideals with the students of your school district! "She did a great job relating to us, her students." "Miss Geesey is wonderful at making songs more musical through dynamics and enunciation. She is also able to correctly demonstrate everything for us to make our learning process easier." "Miss Geesey never showed a negative reaction when we screwed up; she only asked for us to correct ourselves and told us how and what she wanted." 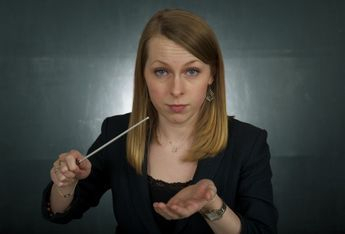 "Miss Geesey demonstrates an extraordinary understanding of the pieces she conducts, allowing her to provide a better musical experience for her students."